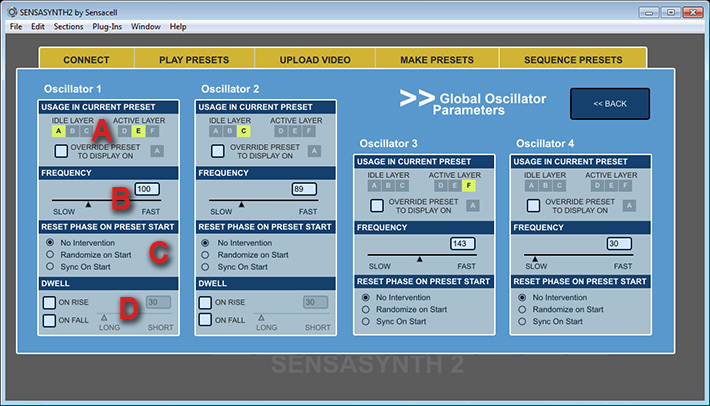 There are 4 discrete oscillators that can be used by and of the 6 Signal Selectors in SensaSynth2. Changing the parameters for an Oscillator changes the appearance of that Oscillator everywhere it is used in that Preset. To layer 2 different Oscillators in a Layer, use two different Oscillators. Oscillators 1 and 2 have extra parameters for the Dwell functionality, explained below. Otherwise each of the Oscillators has the same interface. 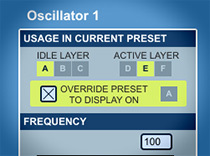 The photo examples below use screen grabs of the Oscillator 1 interface as an example. When you are finished editing these parameters and hit the Back button to go back to the Make Presets section, then this override is removed and the preset reverts to the settings in the current preset. This slider changes the rate of oscillation from slow to fast – in other words the frequency with which the oscillator ramps from its brightest value to its darkest value. The Oscillator algorithm introduces small occasional variations – on a “pixel by pixel” basis – to the frequency of a given ramp up /ramp down cycle. This is what creates the overall look across all the pixels in a Sensacell display of a common oscillation frequency (apparent oscillation rate) but a random phase (the position at a given time in the ramp up / ramp down cycle) . When the Sensacell is powered on, it takes a little while for these variations to fully randomize the phase of all the LED pixels. In the this period the oscillations start in sync and gradually become more random.